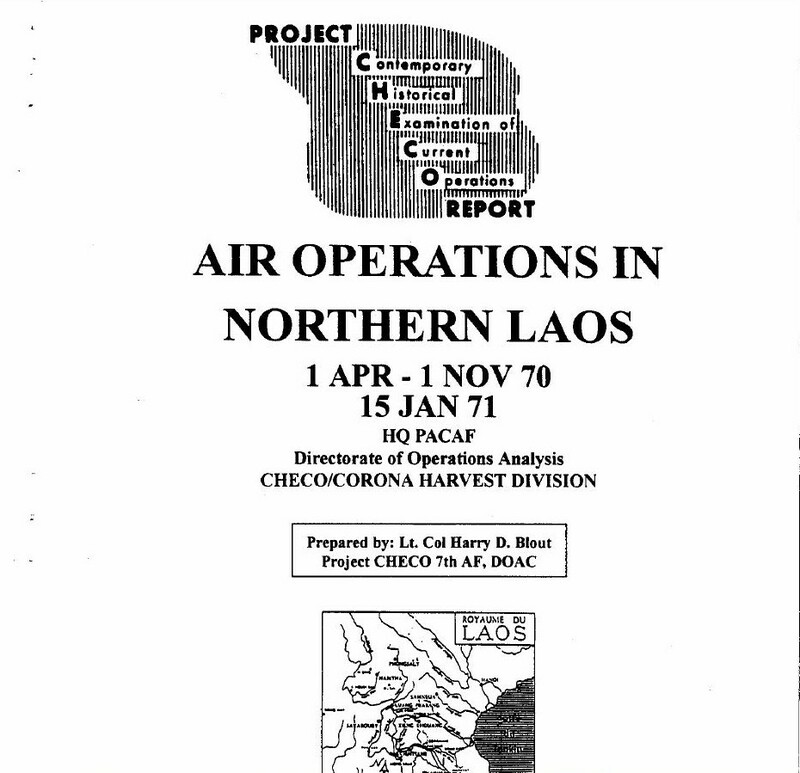 Attached here are Kurt Priessman’s seminal Project CHECO (Contemporary Historical Examination of Current Operations) reports for Laos and Cambodia. They are a real eye opener and a big help for trying to remember which Lima Site you were at back then. There were so many that they blur after 40-odd years. Eventually every Karst and mountaintop looks similar. We used highways and rivers to navigate with in good weather and a compass with allowance for wind in bad. Project CHECO wasn’t declassified for quite some time after the war in order to protect a lot of asses. It’s refreshing to see them come to light and illuminate history. It’s fun to see what was going on up at the nominal 7th/13th AF Headquarters at Udorn even though we all took our orders from Ambassador Godley. From what I gather, he was an improvement over “No-nape” Sullivan. That is an allusion to his strict policy of over-managing our air strike requests and frag orders from 7th TACC. At any rate, it illuminates another side of war no one knew was in progress. This entry was posted in From the footlocker, Vietnam War history and tagged ASKNOD BOOK, asknod.org, asknod@wordpress.com, Gulf War Vets Help, Help with vA Claims, Korean War Vets Help, PROJECT CHECO LAOS, Service Connection, Veterans claims help, Vietnam Veterans Claims Help.. Bookmark the permalink.